Sometimes it feels like everyone in the geoscience world was in Tucson for the gem and mineral shows earlier this month. I just stumbled across a series of posts by Astronomy magazine blogger David Eicher who reports mostly on the event being the world's biggest gathering of meteorite buyers and sellers. So, why was Astronomy covering it? "...by holding Earth minerals in our hands, we are looking at the best examples of planetary geology we can get. And because chemistry is the same throughout the universe, Earth minerals give us a look at what exoplanets may be like throughout the universe." It was obvious that meteorites were a big deal this year. Along just one hall at the Hotel Tucson City Center (formerly Inn Suites), I found four meteorite dealers [right, my snapshot of one display case with a variety of meteorites] The success of the "Meteorite Men" show on the Discovery Channel may be helping fuel a fascination with these extraterrestrial specimens. The stars of that show were in attendance as well, with book signings and their own popular retail operation. A new national report on campus use of geothermal energy includes a ground source heat pump system at Arizona's Yavapai College and earth-sheltered buildings at ASU and UA. "Going Underground on Campus features examples from more than 160 campuses in 42 states, examining ground-source heat pumps, direct geothermal, aquifer and lake-based, geothermal electricity, and earth-sheltered buildings." "This guide finds that energy savings over conventional heating and cooling systems on campus range from 50-75% for ground-source heat pumps, 30-40% for earth-sheltered buildings, and even more for direct use geothermal (which can also cover electricity)." 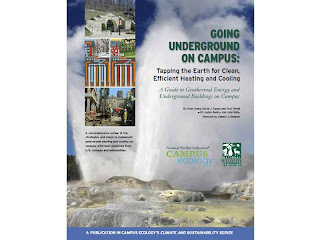 Ref: Going Underground On Campus: Tapping the Earth for Clean, Efficient Sources of Heating and Cooling, By Stan Cross, David J. Eagan, and Paul Tolme, National Wildlife Federation, 74p, February, 2011. The global demand for iron is being pushed in part by China's insatiable appetite for natural resources. That is causing exploration companies to revisit Arizona's iron ore deposits. The Transition Zone across the state is home to a variety of Precambrian deposits of hematite and magnetite, which seem to be the primary sources of iron ore in the region. AZGS Bulletin 180 [right] and US Bureau of Mines Circular 8236 are the best references. There are numerous known deposits with 10 -100 million tons (small circles in figure) and a few over 100 million tons (large circles). Many deposits range from 30-65% Fe (pure hematite has ~70% Fe). 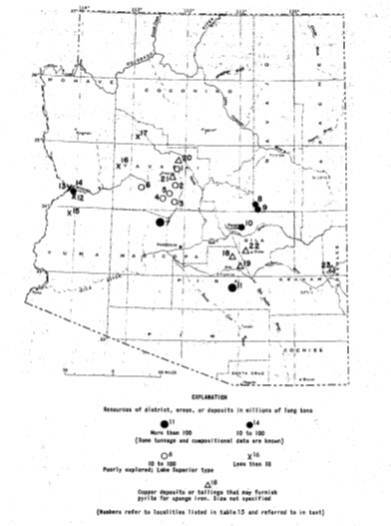 Companies have been exploring Arizona's iron deposits for many decades. Hurdles to development have been the economics, transportation, and the presence of trace elements in some areas that could present problems in the metallurgical process. Thanks to Mike Conway and Nyal Niemuth at AZGS for updating me on this topic. A dusting of snow covered the Tucson Mountains just before dawn. It will likely be gone in a few hours as the temp climbs to 52F today. Looks like we've survived the Great Blizzard of '11 here in Baja Arizona. 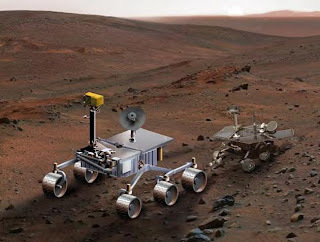 ASU researchers are team members for the Mars Science Laboratory which is scheduled to launch this fall. Read details of the various cameras and analytical instruments in the new issue of "SESE Source" the news magazine of the ASU School of Earth and Space Exploration (SESE). The Yuma broadband seismic monitoring station run by AZGS was shot up a few weeks ago, with numerous bullet holes and one large blast through the station's solar panel that provides power to the site. NAU seismologist Lisa Linville [right] and AZGS geologist Jeri Young, swapped out the destroyed panel last week and did other maintenance on the station. The station is one of 8 we acquired from the EarthScope's USArray project two years ago when the temporary network was redeployed as part of a nationwide research program. Our station nearest the Palo Verde nuclear generating station was destroyed by thieves last year who ripped out wiring and cables as well as the power system. NASA's Earth Observatory Image of the Day is from the Advanced Land Imager (ALI) on NASA’s Earth Observing-1 (EO-1) satellite, which captured this natural-color image on April 17, 2010. SP Crater is a basaltic cinder cone in the San Francisco Volcanic Field, northeast of Flagstaff. Anderson, R. (2009, March 16). SP Flow and Sunset Crater. Martian Chronicles, AGU Blogosphere. Accessed February 17, 2011. Priest, S.S., Duffield, W.A., Malis-Clark, K., Hendley, J.W. II, Stauffer, P.H. (2001, December 21). The San Francisco Volcanic Field, Arizona. U.S. Geological Survey Fact Sheet 017-01. Accessed February 6, 2011. 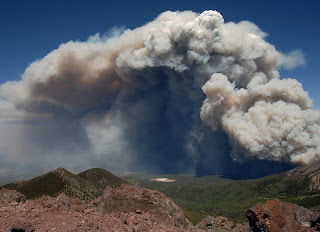 Volcano Hazards Program Photo Glossary. (2008, July 17). Cinder Cone. U.S. Geological Survey. Accessed February 6, 2011. Volcano Hazards Program Photo Glossary. (2009, July 17). Basalt. U.S. Geological Survey. Accessed February 6, 2011. 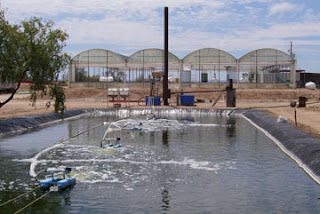 The Desert Sweet Shrimp farm in Gila Bend drew lots of attention for using geothermal waters to grow shrimp in the desert. But the flood of low-cost shrimp from Asia apparently dropped the bottom out of the market, making it unprofitable for them to compete. 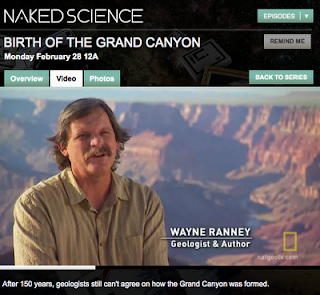 You will recognize Arizona geologists Wayne Ranney and Ron Blakey among others, in the new documentary on National Geographic tv - "Birth of the Grand Canyon." Wayne offers personal insights on the filming of the show on his blog, Earthly Musings. The premiere was last night (I didn't home from my dinner meeting in time to see it) but it will be re-broadcast on February 28 and March 3. 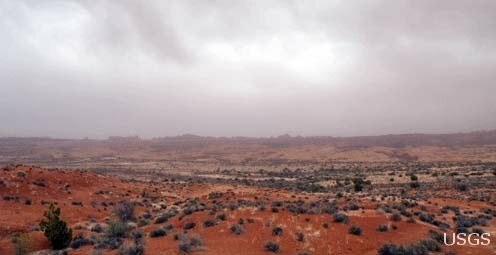 A new study published by the Proceedings of the National Academy of Sciences, warns that "sustained drought conditions across the Southwest will accelerate loss of grasses and some shrubs and increase the likelihood of dust production on disturbed soil surfaces in the future," according to an announcement by the USGS. However, they also noted that "the community of cyanobacteria, mosses and lichens that hold the soil together in many semiarid and arid environments—biological soil crusts—prevented wind erosion from occurring at most sites despite reductions in perennial vegetation." There are a great set of demos of the Minerva software application, including a 3D fly-through of the Grand Canyon, that's nicely done. Adam Kubach at Univ. of Texas briefed us this afternoon on Minerva during the iPlant GIS advisory meeting at the UA. Minerva is an open-source program for viewing geospatial data that works on Windows, Mac, and Linux. 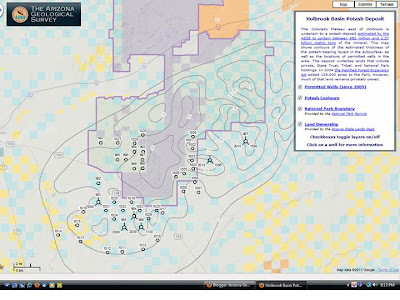 It unifies standard GIS capabilities with high-performance, 3D visualization. Minerva's primary strength is the ability to display raster and vector data together from multiple sources at interactive speeds. It can easily display large terrain and image repositories because it automatically draws the appropriate level of detail. Minerva was started as a project at the Fulton High Performance Computing Initiative at Arizona State University. Minerva has seen heavy use at the Decision Theater, the production visualization facility at ASU. Projects completed with Minerva vary from school enrollment and disease propagation to real-time weather prediction. There's also a simulation showing the Phoenix-Mesa Gateway Airport with the groundprint of sound from planes taking off. And take a look at the Mars and Moon clips. 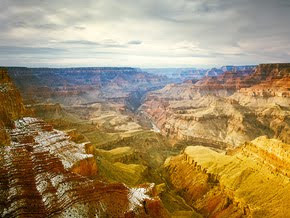 Minerva -- Grand Canyon Tour from Perry Miller on Vimeo. 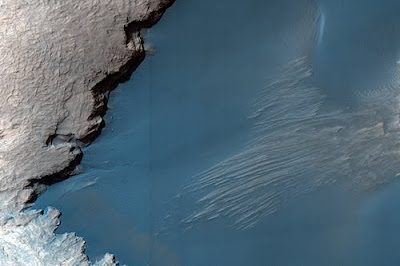 The UA HiRISE camera on the Mars Reconnaissance Orbiter is once again dazzling us. 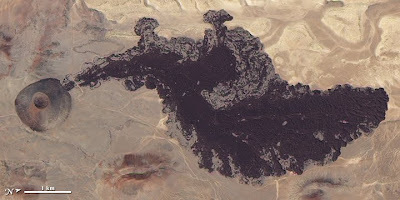 "This image shows part of the floor of Rabe Crater, a large (108 kilometers, or 67 miles in diameter) impact crater in the Southern highlands. One puzzling question is why the dunes are dark compared with the relative bright layered material contained within the crater. The probable answer is that the source of the dark sand is not local to this crater; rather, this topographic depression has acted as a sand trap that has collected material being transported by winds blowing across the plains outside the crater." Tip of the hat to Daily Galaxy for choosing this as the Image of the Day. 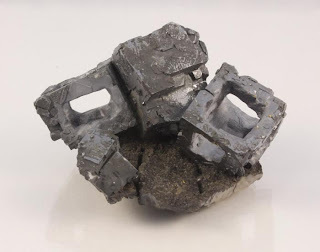 A new report from the USGS describes the history of rare earth production in China compared to the rest of the world, and the role of government policies. It's only 15 pages but it offers a much more detailed understanding of the recent restrictions on exports than I've read elsewhere. 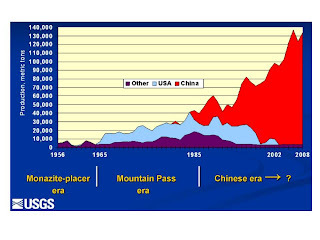 "The volume of China’s rare-earth output as a percentage of total world output increased to more than 90 percent in 2008 from 27 percent in 1990. During the past 15 years, China has supplied more than 80 percent of the world’s rare earths..."
World-wide concerns about the supply of these elements for modern technology has set off a global rush to find new deposits or re-open old ones, and to find ways to recycle REE's from electronics. UA geoscientist Jonathan Overpeck is co-author on two high-profile papers published in the past week. In an issue of Science dedicated to "Dealing with Data" he addresses the challenges of dealing with increasing volumes and complexities of climate data and public access to them [right, climate change models depending on what actions are taken]. "Our understanding of how the climate system functions is built on a foundation of climate data, both observed and simulated. 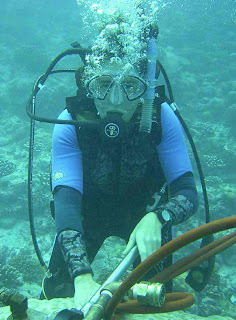 Although research scientists have been the main users of these data, an increasing number of resource managers (working in fields such as water, public lands, health, and marine resources) need and are seeking access to climate data to inform their decisions, just as a growing range of policy-makers rely on climate data to develop climate change strategies. Quite literally, climate data provide the backbone for billion-dollar decisions. With this gravity comes the responsibility to curate climate data and share it more freely, usefully, and readily than ever before." Today, Arizona Daily Star reporter Tom Beal describes an article in Climatic Change Letters by Jeremy Weiss of UA, Overpeck and colleague Ben Strauss, in which they conclude that "If global temperatures continue to rise and polar ice continues to melt, 9 percent of the land in our coastal cities and towns will be beneath sea level by the end of the century." 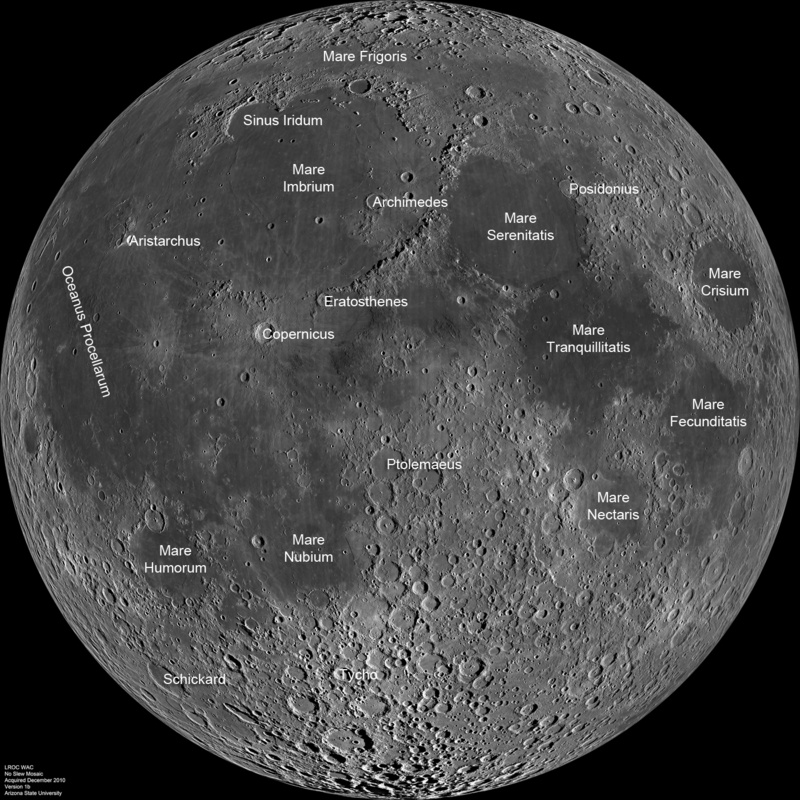 "I’ve spent a lot of time at the eyepiece looking at the Moon, but I’ve never seen it like this. The detail is amazing, and the shadowing provides a sense of depth you just can’t get when observing the full Moon from home. It’s beautiful." 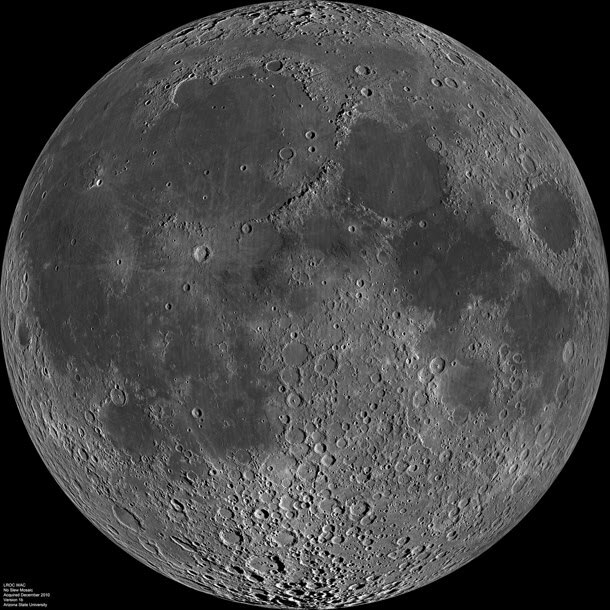 "This is actually a mosaic of about 1300 separate images taken by the Lunar Reconnaissance Orbiter’s Wide-Angle Camera — the total size is a whopping 24,000 x 24,000 pixels, producing a resolution of about 145 meters/pixel. The full-size version is a monster 550 Mb TIF file (seriously, don’t grab that one unless you need it! ), and you can get a more palatable 1400 x 1400 pixel version with labels, too." The University of Arizona Tree Ring Laboratory, founded in 1937, holds 2 million samples, tracing the lat 8,000 of earth and human history. It's "the world's largest collection of tree rings and it's an irreplaceable, one-of-a-kind resource of environmental and cultural history," according to a profile at the UA web site. Emotions are running high over the Draft EIS released on Friday for uranium mining in northern Arizona. Many of the news stories give the perception that mining is being considered in the Canyon or on its rims. Others claim the decision has already been made to withdraw the million acres, despite the DEIS having no preferred alternative. Cyndi Cole with the Arizona (Flagstaff) Daily Sun, does as good as I've read with her story, "Few easy answers on mining." Solar is hot. The winds of change are blowing. But in the words of Rodney Dangerfield, geothermal don't get no respect. After roaming in the wilderness since the end of the country's brief immersion in renewable energy in the late 1970s following the oil crisis, interest in geothermal is trying to come back but it faces many challenges. An article in the New York Times lays out the list of problems. Geothermal is the oft-forgotten renewable energy step child at the state and national policy levels. Incentives common for solar and wind are only recently considered for geothermal, but are applied intermittently. Permitting and regulatory hurdles mean up to 7 years to get a geothermal plant running compared to expedited processes of 2 years for solar and wind. Geothermal advocates say a more strategic national focus is needed if we're going to take advantage of this vast resource. "More please!" Tracy Bame, head of the Freeport McMoRan Foundation told the 60 of us gathered for the Arizona STEM Network meeting last week, that the biggest challenge the Phoenix-based company faces is not regulations, but finding enough technically qualified employees. The Arizona STEM (Science, Technology, Engineering, and Math) Network met with leaders of successful STEM programs from other states (NY, WA, NC, OH, & TX) who described their "best practices" and shared the results of their successes. The idea is to learn from them before we launch our own statewide effort. The AZ STEM Network is headquartered in Science Foundation Arizona with substantial business and industry support. The program team will be traveling around the state in March to meet with local education and business leaders. I've read the Green Valley News article from last Saturday a couple times now and have to admit, I'm still confused over the arguments between Farmers Investment Company (FICO) and Community Water Company over plans for each to build similar pipelines to carry Central Arizona Project water to the area to recharge the aquifer. Rosemont Copper is supporting the CWC plan, while FICO is one of the most vocal opponents to the mine. The water table in the area is dropping dramatically, due to overpumping of groundwater, primarily from agricultural use, resulting in substantial subsidence [right, Green Valley subsidence area, 2-2009 t0 1-2010. The Rosemont mine is off the figure to the right (east). Credit, AZ Dept. of Water Resources]. But there are obviously more details and nuances to the debate than the recent story can cover, and I have not followed the argument that closely. 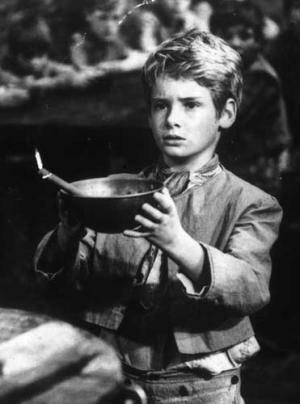 Haven't we seen the proposed federal budget cuts for science before? 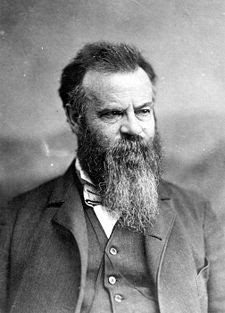 "One of the schemes of the parties who manipulate the so-called Geological Survey in Washington, is to abolish the Coast and Geodetic Survey, and let its work be done by the former, which is now directed, or as many believe, misdirected, by Major Powell. There are few real scientists in the country who believe such a move would be wise. The Coast and Geodetic Survey has been in existence for about eighty years, and has done very valuable work, which all the world of science recognizes. Nothing of the kind can be said for the Geological Survey, since it became a political machine under Major Powell's direction"
Thanks to Vince Matthews, Colorado State Geologist, for forwarding this quote. "Hindu Kush" is the name of the mountain range that stretches between central Afghanistan and northern Pakistan, and is where the rough gems - ranging from emeralds and rubies to peridot - and rare minerals in the "Dangerous Beauty" exhibit come from. The beauty of the specimens is undeniable, and yet the risks that artisanal miners take to extract specimens by hand from the high altitude mines, and decades of violent political turmoil, make mining and transporting gems and minerals dangerous work. 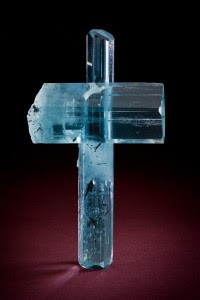 The exhibit boasts some of the finest aquamarine crystals ever discovered in these perilous mountains, and includes both one of the largest Afghan morganite specimens ever found, and the largest known morganite crystal ever recovered from Pakistan - just three weeks ago. Other outstanding specimens include a large, pink tourmaline in matrix, kunzite crystals half a meter long, and crisp, clear quartz crystals. AZGS geologists assessed paleo- and recent debris flows in Organ Pipe Cactus National Monument, as part of our ongoing geologic mapping of the area in partnership with the National Park Service. Ann Youberg took this picture of debris flow deposits formed in 2008. This area of the Monument has been off limits the past year due to concerns over drug smugglers in the area, but the NPS provided security escorts to the AZGS team. Everyone at the Tucson Gem & Mineral Show last week stopped by the giant gold nugget (51 lbs) from Australia. The theme of Minerals from California brought out a plethora of native gold and tourmalines as well. The U.S. relies on foreign sources for 90% of energy critical elements such as indium, lithium and tellurium – used in electric cars, wind turbines and solar cells. China currently produces 95% of rare earth elements. 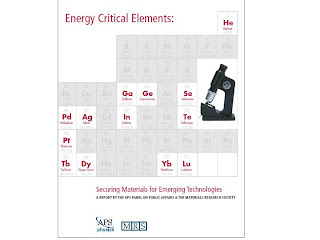 A highly anticipated new report, Energy Critical Elements: Securing Materials for Emerging Technologies, "describes a plan to secure future supplies of rare earths and other elements critical to the development of new technologies to foster U.S energy independence." The report notes that "A shortage of these 'energy-critical elements' (ECEs) could significantly inhibit the adoption of otherwise game-changing energy technologies. This, in turn, would limit the competitiveness of U.S. industries and the domestic scientific enterprise and, eventually, diminish the quality of life in the United States." There are important implications from this report for Arizona. Tellurium is used in conjunction with cadmium in solar panels produced by Tempe-based First Solar. The report recommends against creating national stockpiles of any of the elements, except for helium. The St John's helium-CO2 field is currently under development in eastern Arizona. The USGS reports a magnitude 5.1 earthquake at 10:47 a.m. local time this morning near the Baja - Sonora border in Mexico. There are reports of mild ground shaking being felt in Yuma. 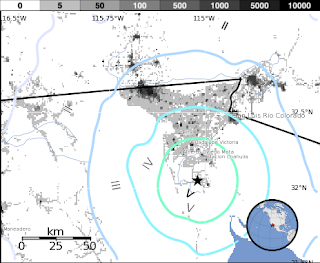 The quake lies along the southern extension of the San Andreas fault. update 2-18-11, 21:00: The Yuma Sun describes local residents being 'shaken, not stirred' by the quake, which occurred near where the magnitude 7.2 Easter quake occurred. The USGS is reported saying there was magnitude 3.1 'foreshock' yesterday. It looks like there may be a fight brewing between the City of Flagstaff and the Navajo Nation over groundwater. 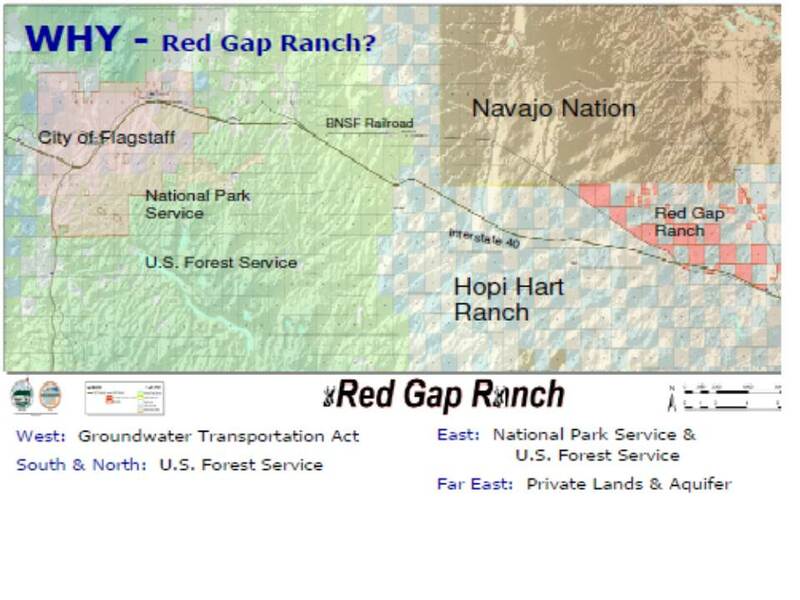 The Arizona Daily Sun reports that the city council approved a $1.8 million drilling project on the city-owned Red Gap Ranch 35 miles east of Flagstaff. Reporter Joe Ferguson says Navajo Nation is threatening suit because they believe "the city wants to drill immediately so that the wells are exempted from a future regional water settlement that might preclude any city drilling." The library of the USGS Tucson regional branch office was dedicated tonight in memory of Karen Bolm, long-time geologist who was widely considered the 'face of the USGS' in southern Arizonan because of her commitment to public engagement and outreach. Karen died in 2009 shortly after being diagnosed with liver cancer. A few dozen friends and colleagues gathered after work to share remembrances and tour the newly organized library with a brass plaque denoting the dedication. ASU grad student Erin DiMaggio is working on a science education outreach project for middle and high school teachers as part of her ASU/NASA Space Grant Fellowship. Erin has developed some pretty neat, prepackaged science lessons as part of her SciNews project that engage students in learning about current science events (e.g., latest earthquakes, oil spills, geological discoveries, astronomical discoveries). All of the lessons meet Arizona state educational standards, making them that much easier for teachers to grab-and-go. Thanks to David Haddad for alerting us about Erin's project! The Interior Dept. announced release tomorrow of the Draft EIS for hard rock (read uranium) mining in Northern Arizona. This triggers a 45 day public comment period on the 4 alternatives proposed. There is no preferred alternative recommended. But that hasn't stopped newspaper editors from tossing around a variety of headlines that range from "Interior plan bans mining claims near Grand Canyon" (Business Week), to "Demand for uranium threatens Grand Canyon biodiversity" (Guardian), to "Feds outline options for mining near Grand Canyon" (most common headline after the initial flurry). Alternative A is for no action, leaving the area open to mining. The other 3 alternatives all call for a 20-year withdrawal but for differing amounts of land - 1 million, 650,000, or 300,000 acres. Because of the confusing press responses to the story, the full press release from DOI follows below. Note that three public meetings on the DEIS will be held in Arizona during March 7-9, with another set for Salt Lake City. AZGS is a cooperating agency in the EIS process and got a review copy earlier. WASHINGTON -- The Department of the Interior has prepared a Draft Environmental Impact Statement (EIS) and is seeking public comment on a proposal to withdraw lands in the Grand Canyon watershed that would affect uranium and other hardrock mineral development in that area. 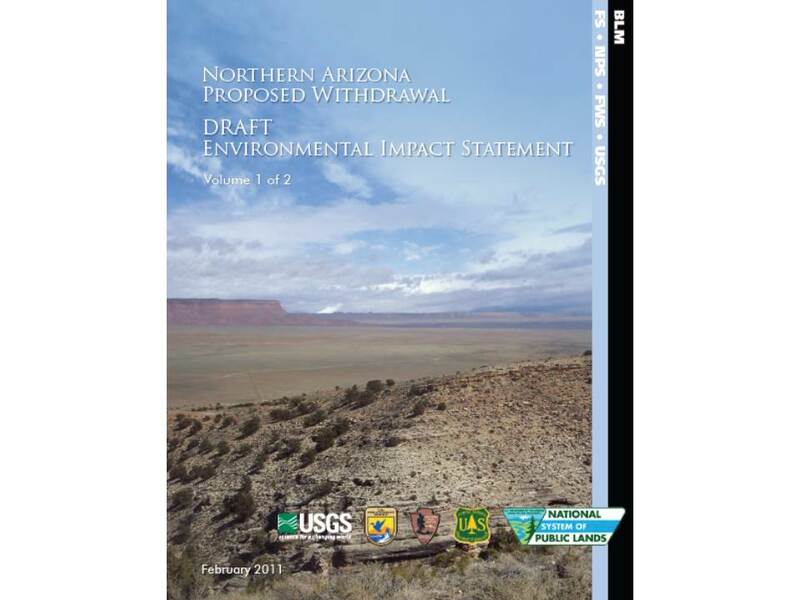 The Northern Arizona Proposed Withdrawal Draft EIS, which will be available for public review and comment on February 18, 2011, was prepared by the Bureau of Land Management (BLM), acting as lead agency in cooperation with the U.S. Forest Service, the U.S. Geological Survey, U.S. Fish and Wildlife Service, the National Park Service, and other state and local agencies and in consultation with seven American Indian tribes. Public input on the Draft EIS will be used to inform a final decision made by the Secretary of the Interior on the proposed withdrawal. In accordance with the National Environmental Policy Act, a notice published by the Environmental Protection Agency in the Federal Register initiates a 45-day public comment period. The Draft EIS discusses the potential impacts that each of four alternatives would have on the human environment and natural and cultural resources. The Draft EIS does not identify a preferred alternative. · Alternative A is the No Action Alternative, under which no withdrawal would occur and hardrock mineral exploration and mining would continue throughout the study area in accordance with existing BLM and Forest Service regulations and land use plans. · Alternative B is to withdraw about 1 million acres from hardrock mineral exploration and mining for 20 years subject to valid existing rights. The land is in three parcels: two are north of the Grand Canyon National Park on BLM Arizona Strip and Kaibab National Forest lands; and one is south of the Grand Canyon also in the Kaibab National Forest. The authority for the withdrawal comes from Section 204 of the Federal Land Policy and Management Act. If implemented, this withdrawal would not prevent any other development under laws regulating mineral leasing, geothermal leasing, mineral materials or public lands. · Alternative C is to withdraw a reduced area of about 650,000 acres from hardrock mineral exploration and mining for 20 years, subject to valid existing rights. This is the largest contiguous area with resources that could be adversely affected by mineral exploration and mining. The resources potentially affected are cultural, hydrologic, recreational, visual, and biologic. 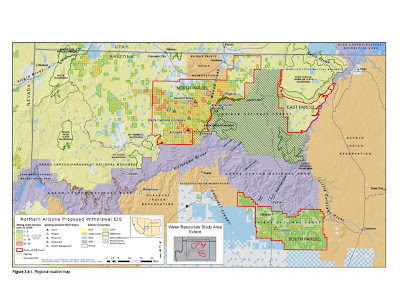 · Alternative D is to withdraw a further reduced area of about 300,000 acres from hardrock mineral exploration and mining for 20 years, subject to valid existing rights. This is the largest contiguous area with the highest concentration of resources that could adversely be affected by mineral exploration and mining. In July 2009, Secretary Salazar proposed the withdrawal of nearly one million acres of federal lands in the Arizona Strip (BLM) and Kaibab National Forest (USFS) from location and entry under the Mining Law of 1872 for up to 20 years, subject to valid existing rights. Notice of the Secretary’s proposal was published in the Federal Register on July 21, 2009, which resulted in the segregation of those lands from location and entry under the Mining Law, subject to valid existing rights, for up to two years. A decision to withdraw the subject lands from location and entry under the Mining Law, subject to valid existing rights, would prohibit the filing of new mining claims in an area that has previously been open to location. If the land is withdrawn, previously-approved mining operations could continue under existing surface use authorizations and new operations on mining claims that pre-date the proposed withdrawal on July 21, 2009, could be developed only after a determination that the mining claims were valid as of that date. Public meetings are being scheduled to take place from March 7 to 10, 2011, in Phoenix, Flagstaff, and Fredonia, Arizona, and in Salt Lake City, Utah. Comments must be in writing and either mailed to Bureau of Land Management, Arizona Strip District, 345 East Riverside Drive, St. George, UT 84790, or sent as an email to NAZproposedwithdrawal@azblm.org. March 7, 2011 National Training Center, 9828 North 31st Avenue, Phoenix, AZ 85051. The National Training Center (NTC), a federal building, requires non-government personnel to show drivers license, state identification or passport. March 8, 2011 High Country Conference Center, Agassiz & Fremont Rooms, 201 West Bulter Avenue, Flagstaff, AZ 86001. March 9, 2011 Fredonia High School, Media Center, 221 East Hortt Street, Fredonia, AZ 86022. March 10, 2011 Homewood Suites, Santa Fe and Rio Grande Conference Rooms, 423 West 300 South Salt Lake City, UT 84101. Coconino County supervisors were briefed on Tuesday about the possible flood control measures needed for the Timberline subdivision that flooded last summer after the Schultz fire denuded the slopes above the alluvial fan based homes. AZGS geologist Ann Youberg participated in the county review of 6 options presented by engineering firms a couple weeks ago. They ranged from building a massive set of diversion berms that would de facto become regulated dams, to leaving the area as it is but buying out all the homes. The latter option was suggested as being cheaper than building enough flood control structures to protect the properties. Such actions have been taken elsewhere in the state. The larger project proposals have price tags of $30 million or more. 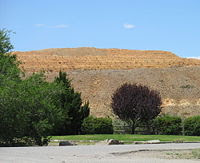 The President's budget plan for FY12 includes a proposal to impose an Abandoned Mine Lands fee, "so that the hardrock mining industry is held responsible in the same manner as the coal mining industry," according to an analysis by Dorothy Kosich on Mineweb.com. This is in addition to the first-time ever 5% mineral royalty proposal that I reported on yesterday. The UA Mineral Museum had raised over $1.5 million by last Saturday through the sale of surplus or duplicate specimens from its collection. That's enough, according to Museum director Bob Downs, to fund a permanent endowment that will cover the costs of keeping a full time curator for the Museum. The Museum hopes to raise around $3 million in total from the mineral sales. I stopped by Dr. Marcus Origlieri's Mineral Zone booth at the Tucson Gem & Mineral Show on Sunday. The tourmalines and native gold at right were a few of the show pieces still available. Mark Candee, museum curator, also described plans for special centennial exhibit next year at the museum to bring together the most outstanding examples of Arizona minerals. He said initial response from collectors about showing their specimens has been extremely positive. Dr. Julia Cole, professor in the UA Department of Geosciences, is one of 21 Google Science Communication Fellows announced yesterday. Google says "In an effort to foster a more open, transparent and accessible scientific dialogue, we’ve started a new effort aimed at inspiring pioneering use of technology, new media and computational thinking in the communication of science to diverse audiences. Initially, we’ll focus on communicating the science on climate change." "Fellows will be given the opportunity to apply for grants to put their ideas into practice. Those with the most impactful projects will be given the opportunity to join a Lindblad Expeditions & National Geographic trip to the Arctic, the Galapagos or Antarctica as a science communicator." AZGS geologists Joe Cook [right] and Mike Conway joined participants of the 3-day Water Education Foundation field tour to earth fissures today at the southern end of the Casa Grande Mountains -- near the intersection of S Sunland Gin Road and W Hauser Road -- to describe the impact of ground water overdrafts on subsidence and earth fissure formation in alluvial basins of south-central Arizona. The Water Education Foundation, a nonprofit organization headquartered in Sacramento, CA, is leading a three-day tour of 51 individuals from state and federal agencies, industry, and nonprofits across southern Arizona exploring water and water-use challenges facing Arizona in the 21st century. 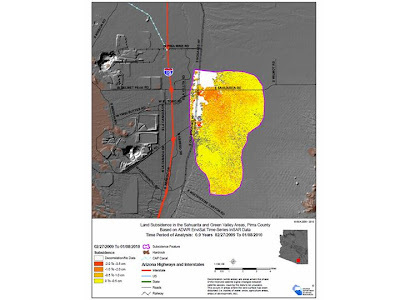 The USGS has released a fact sheet on breccia pipe uranium mining in northern Arizona, based on the results in their 2009 report. 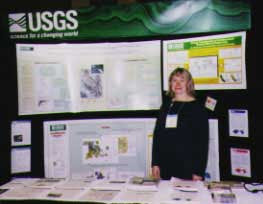 The USGS studies provide estimates of uranium resources affected by the possible land withdrawal, examine the effects of previous breccia-pipe mining, summarize water-chemistry data for streams and springs, and investigate potential biological pathways of exposure to uranium and associated contaminants. BLM will release the draft EIS regarding withdrawal of a 1 million acres of federal lands from exploration and mining, later this month for public comment. 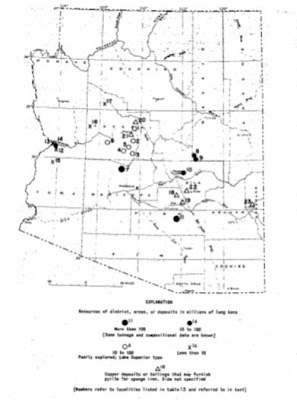 Ref: Bills, D.J., Brown, K.M., Alpine, A.E., Otton, J.K., Van Gosen, B.S., Hinck, Jo Ellen, and Tillman, F.D, 2011, Breccia-pipe uranium mining in northern Arizona; estimate of resources and assessment of historical effects: U.S. Geological Survey Fact Sheet 2010-3050, 4 p.
Gov. Jan Brewer signed the law on February 14, the state's 99th birthday, making Arizona the "Grand Canyon State." The designation has been on our license plates for years, but no one actually got around to making it official until now. Two resolutions were filed in the Arizona Legislature dealing with mining issues. SCM1007 - Sen. Al Melvin's resolution urging the Secretary of Interior to refrain from withdrawing uranium bearing Arizona lands from new mining claims and exploration. SCR1052 - A resolution by Sen. Schapira and Rep. Ash calling for the State Mine Inspector to be appointed by the governor rather than elected. The Havasupai Tribe announced the re-opening of the famous Havasu Canyon to tourists beginning May 1. Reservations for the campground and inn will be taken starting Feb. 21. The canyon's facilities were severely damaged by back to back floods in early October but the Tribe has been working relentlessly to repair trails, campground, and other infrastructure in time for the spring season. The Tribe recently became the first sovereign tribe to qualify on their own for federal disaster funds to aid in the reconstruction. The federal budget proposal released yesterday includes a provision for a 5% royalty on minerals produced from new mines on federal lands. The New York Times report says this is viewed as a first step at changing mining to a leasing system similar to that for oil and gas resources. This would be the first such royalties ever imposed. Cuprite (Cu2O) on copper from Russia is the hot mineral at this year's Tucson Gem & Mineral Show that wrapped up this evening after 4 days. But for the past two weeks, a few dealers with rooms in a couple of the external shows have been centers of activities. Czech geologist and mineral dealer Dr. Ivo Szegeny with Karp Minerals, told me that the source in the Rubtsovsk mine in the Rudniy Altay Mountains is effectively depleted, so there will be few if any new specimens hitting the market. I was surprised how many people I knew at the show who were talking about the cuprite on copper pieces they had picked up. Hollowed-out (skeleton) galenas from Bulgaria showed up at the Denver and Munich gem shows a couple years ago and dazzled the mineral collecting world. They reportedly came from an old mine with little hope of additional specimens ever being found. Prices rose to $3,000 - $4,500 for the best specimens. However, a few questions were raised among collectors about the origin of these unusual minerals and 12-year collector Jessica Simonoff [right] arranged access to an SEM at James Madison University. There she discovered microabrasion marks and tiny spherules that were used to create the specimens she examined. 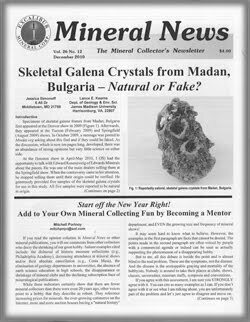 Jessica and Dr. Kearns published a report in Mineral News and posted an article in Mindat.org, suggesting that many of the reverse-skeletal galenas on the market are man-made and thus fakes. Her expose is rocking the mineral collecting world. Copies of her article were circulated on the floor of the just-completed Tucson Gem & Mineral Show. My contact says dealers who had any of the skeletal galenas in their booths pulled them immediately while they check on their authenticity. 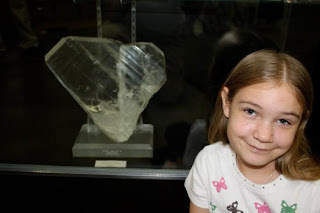 update 2, 2-17-11: read more about Jessica's work at the Mineral Bliss blog and the recognition she received from the Friends of Mineralogy at last weeks Tucson Gem & Mineral Show. The public may be most dazzled by the 51 lb gold nugget from Australia, but the mineral community is agog over the "Emperor" and "Empress" rhodochrosites from China on display in the Collector's Edge booth at the Tucson Gem and Mineral Show (TM). My inside source, code-named Deep Shaft, says the asking price for the Empress is $1.8 million while the Emperor, while not technically for sale, might be acquired for a reported staggering $8 million. Rumor has it that Emperor is returning to China where it could fetch $1 5 million. Get your offers in now.